About Us | Cake Shop Mumbai, Best Cake Shop Mumbai, Order Chocolate Cakes, Order Fruit Cakes, Cream Cakes in Mumbai, Deliver Cakes in Mumbai, Cakes for All, Cakes in Mumbai, Best Cake Shop in Mumbai, Cake Delivery all over Mumbai, Premium Cakes of Mumbai, India. The Company is engaged in the business of manufacturing cakes, pastries, chocolate and brownies. The Company has state of an art manufacturing facility at Charkop, Kandivali (West), admeasuring 14500 sq ft. The Company operates under the brand name “HangOut”, which is copyright and registered in India. We at HangOut adhere to strictest quality of food being manufactured at our factory, with special attention on taste, nutritional properties, textures, shelf life, so on and so forth, before it reaches to the ultimate customers. In order to keep these aspects invariably at a high level, we continuously examine / improve our products and offer customer a best quality product at ‘competitive price’. In this regard, we undertake series of in-house product lab test and periodic customer satisfaction surveys through which we regularly develop, improvement taste that endeavour us to further optimize and expand our horizon and broad range of products. It is rightly said that the success of a business depends on the product that one manufactures and delivers. Keeping the said objective in our mind we at HangOut are consistently on our toes to manufacture new and quality products keeping in mind the ongoing trends, taste, nationally and internationally. We take sheer control while successively selecting produced ingredients as well. Every ingredient used is examined according to strict quality regulations setup internally. During these examinations we make sure to select environmentally friendly goods. We at HangOut just not manufacture cakes; it’s the happiness that we deliver with utmost quality, retaining product taste, vitamins & nutrients, which are especially important for everyone’s health. We at HangOut believe that product distribution is important part of any organization and key element in the entire supply chain. If not managed effectively, this may damage the Company brand and survival becomes difficult. We believe that irrespective of the quality of foods, unless it reaches to the end consumer, the success may not be achieved. In order to provide fastest delivery to our customers, we have our dedicated delivery vans for distribution of goods. The team at HangOut work conscientiously according to standards developed by us that ensure excellent service for our customers. In this Technology-era wherein ordering food is just a touch away, we at HangOut take utmost care on ‘technology aspects’. 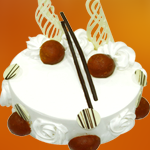 We are successful in having a dedicated website for ordering cakes online, out robust call centre and are on the verge of launching a dedicated mobile app for ordering cakes and pastries. This is in addition to our Webcam enabled monitoring process, Tablet Ordering at Stores, Touch-screen billing system, so on and so forth. The sophisticated latest technologies are being used at our manufacturing unit and periodically being updated. Further, we have established an environmentally sustainable food chain with a focus on better packaging, more efficient use of water, minimised food waste and improved energy efficiency. We also offer a varied selection of seasonal cakes and change our season-oriented menus two times a year. People have started developing taste for the international dishes and on request we do customise cakes under our newly developed section ‘Order Your Own Cake’. On the basis of market analyses and regular trainings as well as by visiting trade fairs, we constantly follow culinary trends and new eating habits. As far as possible, we use our newly obtained knowledge while creating our daily menus. For food and beverage industry, Hygiene is crucial and plays a vital role for ongoing sustainability / growth. Therefore, right from the inception i.e. selection of quality goods, arrival of the raw materials to proper storage, preparation and distribution, our staff members mind the adherence to fixed hygiene standards. Additionally, the defined requirements are regularly examined and take corrective measures whenever and wherever required. Mr. Naveen Samtani, a hotel management graduate along with his spouse Mrs. Saroj Samtani, started a cake shop a decade ago at Lokhandwala Complex, Andheri (West) with a small bakery. With god’s grace the Company has grown multi-fold and acquired a bigger place admeasuring 4500 sq ft at Charkop Industrial Estate, Kandivali (West) with a fully equipped central production unit and robust distribution network. We at HangOut are passionate about developing and providing a high quality output, value-added products to our customers. The Customers are very close to my heart and ensure that they get what they want. We at HangOut, have realised the importance of the aforesaid values and implemented in our organization in day to day activities. My only objective is to provide customers with innovative products at ‘best price’ and deliver happiness on various occasions. A MBA professional, has evolved as one of the Best Bakers Of Cakes and Chocolates in Mumbai. Dedicated, Hardworking, Innovative She is known in the Company as a Solution provider and for innovative out-of-box thinking. She has solutions to all practical business issues. The Company has also plans to collaborate with a foreign brand for Cakes / Chocolates in Europe, for which the process are underway. The Company is also in the process of buying part-timer cakes shops in Mumbai / Navi-Mumbai and also plans to open Factory/Stores at other parts of Maharashtra.